March, 1848: The people of Milan rise up to liberate their city from the rule of the Empire. 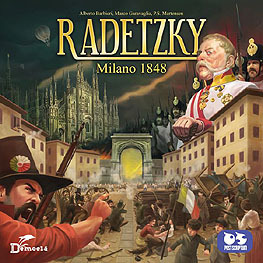 Marshal Radetzky gives orders from Sforza Castle, while patriots and soldiers fight in the streets among the barriicades. BEAT HIM TOGETHER! Cooperate with the other players to make best use of your movement and the actions at your disposal to liberate as many territories as possible - before they are claimed by the Austrian troops.